The Nintendo Switch is arguably the ideal platform for lifestyle and simulation games as you can take it with you anywhere you go. With this in mind, a new Kickstarter Project under this same genre is targeting a December 2019 Switch release. According to the Kickstarter page, Garden Paws by Bitten Toast Games will allow you to grow plants, run a shop, tame animals, rebuild a town and go spelunking in caves. There are also seasons and 24-hour cycles. It’s being described as a "relaxation simulation RPG" experience and in its current state apparently offers more than 20 hours worth of questing and endless gameplay. There's even a PC demo available to try out. Turn your small home and shop into a large farmland through upgrades and questing. Grow seeds into beautiful flowers and vegetables to sell in your shop. Raise and care for animals like chicks and chickens. With more animals to come! Build up the nearby town adding a Museum, Blacksmith, Inn and more! Overcome natural disasters with the help of the townsfolk! Upgrade your tools and weapons. Collect artifacts to sell or donate to the Museum for fame and rewards. Explore caves and dungeons for unique loot! Take a break and do some fishing! Invite up to 3 friends to play with you in your farm! Personalize your character with unique skins, accessories and more. Take a look at the Kickstarter trailer above and tell us if you would be interested in this game. Would you also like to see more lifestyle and simulation games released on the Switch? Leave a comment below. It's just a 3rd party Animal Crossing... how original. Or was it Stardew Valley? Must be a ripoff of both. It looks ok. Not like a game I’d be interested in, but it looks fun enough. @Nincompoop Looks can be deceiving. Although your comment looks like bottom of the barrel trolling, so sometimes looks are spot on. I'd love for Slime Rancher to come to switch. Which is what this game looks a lot like. Looks like Yonder the Cloud Catcher Chronicles (Animal version). Hopefully Physical release for Nintendo Switch in the future. Rip off or Not, So What ?? Don't Toxify the thread with your Satire comments. Sounds like a major revamp of Animal Crossing we have been waiting for since the N64/GCN version of Animal Crossing. @Nincompoop At least it’s not a genre that’s a dime a dozen on Nintendo systems like platformers and JRPGs. Why do people complain? Somebody wants to make a game, and the idea looks pretty good. Not sure if I will back it. At least it isn't another battle royale game! EDIT: I played the demo on my PC...I like it! The demo is very limited, but shows great promise. Interestingly, the in-game time runs faster (not like Animal Crossing, where the time stays pegged to real time) so you can accomplish a days worth of tasks in about an hour. Looking nice. My stepdaughter who basically only plays Animal Crossing no 3Ds and Stardew Valley on Switch would love that game... we have tons of RPGs and FPSs, why the problem with more options for little gamers like her? 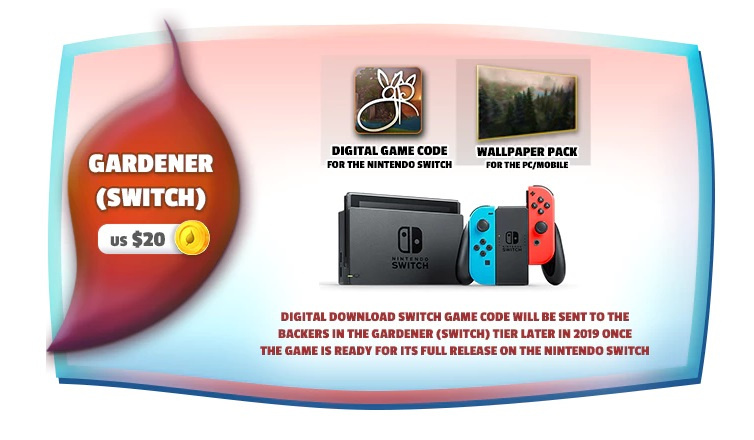 @Liam_Doolan They added a "Switch option" on their Kickstarter pledge page. The dev's make it clear it won't be out until Dec 2019, but said people kept asking for a Switch option, so they created one. Maybe you can update the original story? A project is kicked started for the happiness of the parts. The segment of the new sector and uk.bestessays.com student reviews is inquired for the formation of the better slots for the humans. The roadmap is done for the utilization of the goals for the humans. The program is done for the students in this ambit. I really welcome this release with full excitement.